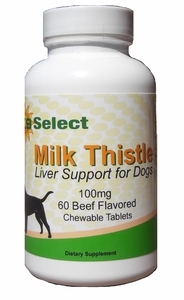 New K9 Select Beef Flavored Milk Thistle for Dogs 60 chewable tablets with 100 mg of milk thistle per tablet. 60 servings. Introducing our new chewable beef flavored liver support for dogs! Same exceptional quality as our Lignans for Life and K9 Choice Milk Thistle, now under our Premium K9 Select Brand in a chewable beef flavored tablet that dogs love! Please note this is a brand new product not yet available in our Canadian warehouse. Orders containing our K9 Select Beef Flavored Milk Thistle with our "Canadian shipping from Toronto" option selected will ship from Arizona. Our new K9 Select Flavored Chewable Milk Thistle for Dogs offers the same great product as our Lignans for Life Milk Thistle, with special instructions on dosage for dogs of all sizes. Our milk thistle supplement contains 100 mg of milk thistle, standardized to 80% silymarin. Each bottle contains 60 delicious tablets you can give to your dog like a treat or place it in your dog's food. Research suggests that Silymarin (the flavolignans removed from milk thistle) and its antioxidant properties can be beneficial for dogs (5). 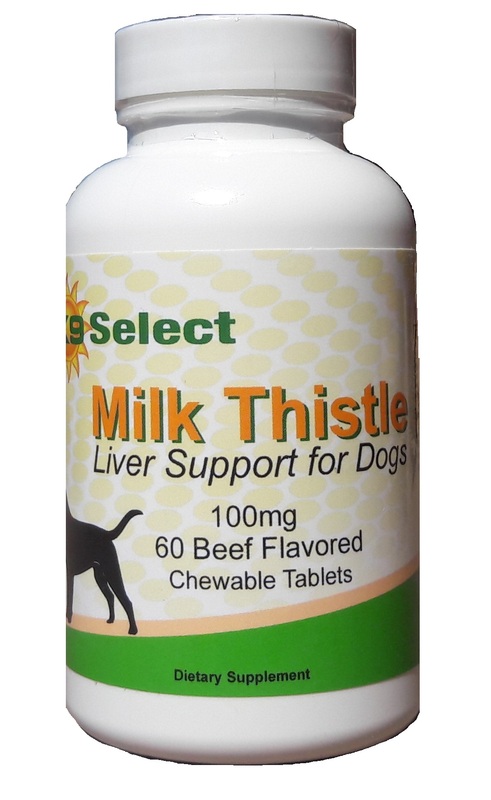 Studies also suggest that milk thistle may support a healthy liver in dogs. Milk Thistle can be beneficial for dogs with Cushings Disease (a common adrenal disorder), as liver problems are often associated with the disease due to the stress it places on the liver. For dogs under 25 lbs, give 1/2 tablet per day. For dogs 25-50 lbs, give 1 tablet per day. For dogs over 50 lbs, give 1 1/2 to 2 tablets per day. Tablet can be administered whole as a treat or hidden in food. It can also be given with a small amount of peanut butter, a small piece of cheese, a pill pocket, etc.